We all have a mode we get into when we are trying to accomplish something. You may put earbuds in to drown out noise. Maybe you find a place of solitude away from people and distractions. It is all about positioning yourself to be productive without anything or anyone interfering with your goals or train of thought. But I often wonder if we do that with God.Without even thinking, we can get into a “mode” of life that we don’t wander from. There’s the weekly schedule, the daily grind, the monotony of a schedule, and the weight of responsibilities. 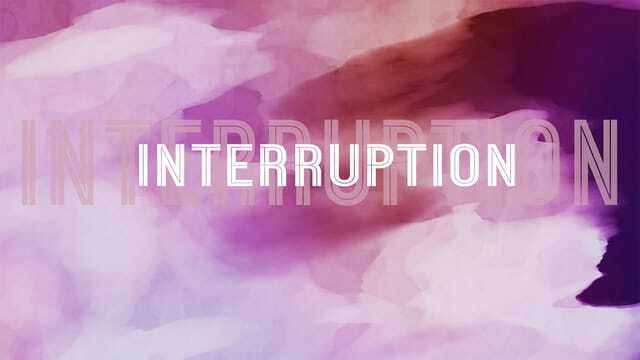 We can get so regimented in life we lose our sensitivity to where the Lord is leading us.As a church community, we are embarking into a six-week series with one goal and one prayer encapsulated in one word: Interruption. Interrupt our status quo. Interrupt our bias of what we think of the Holy Spirit. Interrupt our hate (of ourselves and others). Interrupt our plans.Interrupt the things we feel captive to. Holy Spirit, interrupt us and show us Your glory. Respond to ALL God is with ALL you are. Openness to the Holy Spirit is not about getting a "normative" response from God but what is going to be the normal position of our hearts. The Holy Spirit responds to open hearts more than “perfected” theology. If Christ had waited to love me until I got my act together, He'd still be waiting! Holy Spirit, we declare today that we want more of You. We crave your presence. We desire the power You bring to our lives, not for the sake of “power” but for the sake of boldly declaring Jesus and more accurately representing Jesus to the world. Holy Spirit forgive us for the places and the times where we have grieved You, where we believed we had all of You we needed or all of You we wanted. Forgive us for the times when we told You how You could or couldn’t act in our lives. Holy Spirit, I pray today that You would respond not to our theology, because some of this we can’t understand and can’t explain, but I pray that You would respond to the openness of our hearts. In Jesus’ name, Amen.